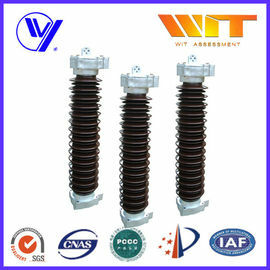 This zinc oxide arrester is mainly used to protect distribution transformer,cable connector and electrical equipment from being damaged by lightning impulse voltage and operating over-voltage. Porcelain surge arrester is a device to protect electrical equipment from over-voltage transients caused by external (lightning) or internal (switching) events. Main features: It adopts double sealing structure, the core encapsulates by molded silicone rubber which completely solves the sealing problem of porcelain housed products.